Although it was settled centuries before the Incas arrived, it was only during the period of Inca control (1438-1532 AD) that the Huatanay River basin, upon which Cusco is built, reached its peak as an administrative, religious and military center. The origins of the city are shrouded in myth and legends which tell the tale of how the Inca empire came into being. One of the most popular myths, from the chronicles kept by the Inca Garcilaso de la Vega, is that of a mythical couple, Manco Cápac and Mama Ocllo, who emerged from the waters of Lake Titicaca to found the city of Cusco and teach its people how to cultivate the land. The city was divided into two sectors: an upper area, or Hanan, and a lowerlying area, or Hurin, references to both the geographical position of each area and the hierarchical position of their inhabitants. Moreover, it is also said that the outline of the first city had the shape of a puma with a falcon’s head. When the Spaniards arrived in 1533, many pre-Hispanic structures were destroyed or used as foundations for new structures, which included churches, convents and mansions built in Baroque or Renaissance styles. Since then, Cusco has become one of the most representative expressions of mestizo culture anywhere in the Americas. Cusco city and the old villages still retain traces of land occupation from the Inca Empire to preserve, in a more global manner, an archaeological heritage, which has become susceptible to the effects of urbanization. Cusco is today an amazing amalgam of the Inca capital and the colonial city. Of the first, it preserves impressive vestiges, especially its plan: walls of meticulously cut granite or andesite, rectilinear streets running within the walls, ruins of the Sun Temple of which the Golden Garden, once covered with sculptures of precious metals, was pillaged by the Spanish soldiers to enrich the coffers of Charles V. Of the colonial city, there remain the freshly whitewashed squat houses, the palace and the marvellous Baroque churches which achieved the impossible fusion of the Plateresco, Mudejar or Churrigueresco styles with that of the Inca tradition. There are several alternative circuits that can be made walking when visiting all these marvelous places that are signaled in the streets. Some of these places need paid entrance (Tourist Pass). Inside the historical centre are located the museums, the main hotels, restaurants, bars and shopping area, also the commercial and bank area. Known in Inca times as Huacaypata, or “the warriors’ square”, this was the scene for many key events in Cusco’s history: it was here that the conquistador Francisco Pizarro declared Cusco under Spanish occupation; it was also here that Túpac Amaru I, leader of the indigenous resistance movement, was killed. The Main Square also hosted to the spectacular Inti Raymi, or festival of the Sun. With the arrival of the Spanish the plaza was fringed by beautiful stone arches which remain in place to this day. Across from the Main Square are the Cathedral and Jesuit church. Built between 1560 and 1664 out of large slabs of red granite taken from the Inca fortress of Sacsayhuaman, the Cathedral is one of the most imposing structures in the city. Its façade, built in Renaissance style, contrasts with the Baroque and silver of its lavish interior. It also houses important collections of gold and silver work of the colonial period, elaborately engraved wooden altars and a beautiful collection of oil on canvas paintings from the Escuela Cuzqueña. On either side of the slabs of red granite are two small auxiliary chapels. One of these, the Del Triunfo church, in fact Cusco’s first Cathedral, was built in 1539 on top of the palace of Inca Wiracocha. Admission fee. Visiting hours: Mon. – Sat. 10:00 A.M. – 6:00 P.M. Sun. and Holidays 2:00 P.M. – 6:00 P.M. 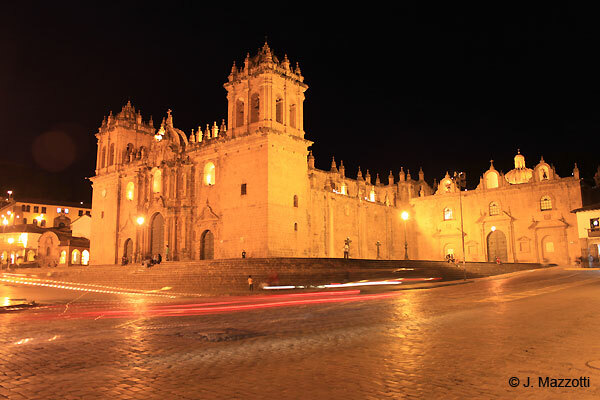 Considered one of the finest examples of colonial Baroque architecture in the Americas, the construction of this church was begun by the Jesuits in 1576 on what was the Amarucancha, or palace of Inca Huayna Cápac. The spectacular façade made of carved stone and its great altar, elaborately covered in cedar and gold leaf and built on top of an underground chapel, are among its most notable features. The church also houses a large collection of sculptures and paintings by the most renowned artists from the Escuela Cuzqueña. The church is flanked by the Lourdes chapel and the ancient oratory of San Ignacio de Loyola. Built in the sixteenth century and rebuilt on numerous occasions as a result of earthquakes which have leveled the city, the convent possesses one of the most beautiful Baroque-Renaissance cloisters in all Peru, decorated with beautiful choir stalls built in the plateresque style, and numerous engravings. It also houses colonial paintings and a very distinctive piece: a tabernacle made of gold and precious stones measuring 1.3 m long and weighing 22 kg, studded with a giant mermaid-shaped pearl (the second-largest pearl in the world). Restored in 2008. Visiting hours: Mon. – Sun. 8:00 A.M. – 12:00 P.M. and 2:00 P.M. – 5:00 P.M. The most important and sumptuous temple in the Tahuantinsuyo was the Koricancha (Quechua voice: Golden courtyard) or Temple of the Sun, which occasionally sheltered images of Thunder and Wiracocha, deities brought from different regions, and mummies of Inca kings. The Inca temple’s inner ritual was restricted to priests, the Inca and the acllas. Its only entrance was on the north side and it had a central courtyard surrounded by buildings made of fine stonework. Curving walls and a series of springs and terraces can be seen to the southwest. Gold sculptures representing at certain festivities. Stone rooms were covered with gold and silver plates. Imaginary lines (ceques) radiated from this temple, linking the huacas and serving as reminders of dates and places for the ceremonies. At fixed dates, representatives of non-Inca populations arrived in Cusco from all over the empire to adore and play tribute to the Tahuantinsuyo gods. Museo de Sitio del Koricancha. (site museum) visiting hours: Mon. – Sat. 8:30 A.M. – 6:30 P.M. and Sun. 2:00 P.M. – 5:00 P.M. See Inti Raymi. The catholic church of Santo Domingo was built on a foundation of smoothened stone structures -the most finely crafted in Cusco- taken from the Inca sanctuary. The façade of the convent is an excellent example of Renaissance art and its distinctive spire, built in Baroque style, stands out over the thatched roofs of the Cusco skyline. Like the two churches mentioned above, it houses an impressive collection of canvas paintings from the Escuela Cuzqueña. Located in front of San Francisco Square. Visiting hours: Mon. – Sat. 9:00 A.M. – 5:30 P.M. Founded in 1645, it has two façades and a single, old Spanish style stone tower. The monumental painting, 12 x 9 meters / 39 x 30 feet, by Juan Espinoza de los Monteros relating the genealogy of the Franciscan family is the highlight of the convent and a beautifully-carved cedar choir. Site museum. This is perhaps the best-known street in the city. 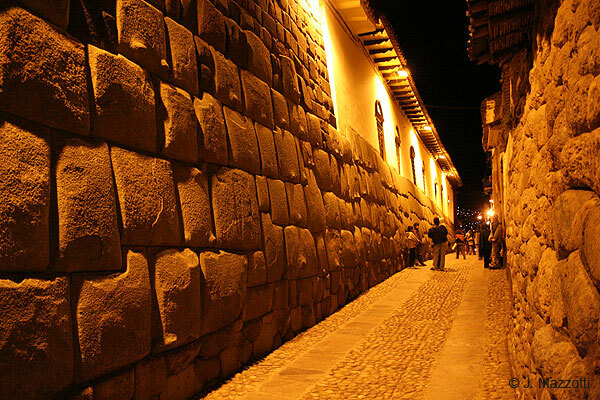 One of its cut-stone walls, (which at present forms part of the Palace of the Archbishop) features the famous 12-sided stone, which was once part of the ancient palace of Inca Roca, one of the rulers of Tahuantisuyo or Inca Empire. This lively street is a gateway to the picturesque San Blas neighborhood. Also known as “the craftsmen’s district”, San Blas neighborhood is one of the most picturesque parts of the city, with its long, inclined narrow streets that zigzag across old estates, which were built with Inca stones, classical blue doors and narrow passageways without cars, and its tranquil squares. Furthermore this district, with one of the finest views of the city, is home to the workshops and stores of the most renowned craftsmen in Cusco, including Hilario Mendívil, Edilberto Mérida, Santiago Rojas and Maximiliana Palomino. Is nestled on a step on a step hillside next to Plaza de Armas (main square), there are many restaurants, bars, hostels. 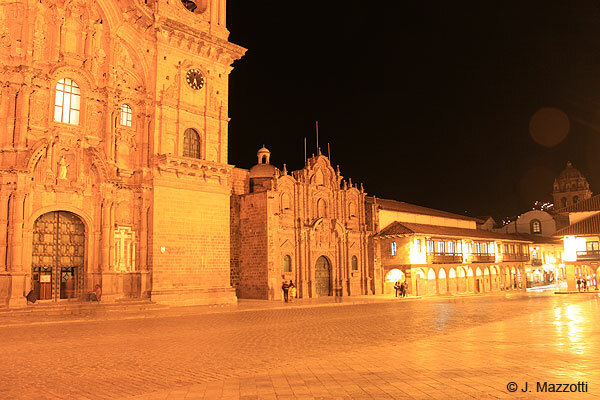 The church of San Blas, built in 1560 during the colonial period, it houses a Baroque pulpit that is itself a masterpiece of carpentry and wood carving, attributed to indigenous artist Diego Quispe Tito, is the oldest parish church in Cusco, has a gold-leaf principal altar. Admission fee. Visiting hours: Mon. – Wed. and Fri. – Sun. 10:00 A.M. – 11:30 A.M. Mon. Sun. 2:00 P.M. – 5:30 P.M. Located in the corner of the streets Garcilaso and Heladeros. Admission fee. Headquarters of the Regional Historical Museum of Cusco since 1984, exhibition of pictorial works of the Escuela Cusqueña. Inca Garcilaso (1539-1616) was the Spanish conqueror's son Sebastián Garcilaso de la Vega and a royal Inca princess, the Palla Isabel Chimpu Ocllo. He was a columnist of the Spanish conquest, the first writer in America; author of "Comentarios Reales de los Incas" (The Real Comments of the Incas), his work is the tearing testimony, exploitation of misfortunes of his homeland, personal conflicts and the narration and exaltation of the Tahuantisuyo, and aching justification of the Spanish conquest. During his childhood he lived in this house, reliquary of the colonial beautifully restored art. Visiting hours: Mon. – Sat. 9:00 A.M. – 5:30 P.M. Located on Cuesta del Almirante street Nº 153. It is one of the most remarkable colonial houses of the city of Cusco (XVII Century). It belonged to Admiral Francisco Aldrete Maldonado, old colonial house with stone facade that shows the coat-of-arms, has a very beautiful ceiling decorated with carved panels. Headquarters of the Museo Inka (Archaeological Museum of the National University San Antonio de Abad), exhibits archaeological pieces of the Inca culture and objects and furniture of the colonial time. Visiting hours: Mon. – Fri. 8:00 A.M. – 6:00 P.M. Sat. and holidays 9:00 A.M. – 4:00 P.M. Located on San Agustín Street Nº 400. The history of the CuatroBustos Mansion is a synthesis of the history of Peru. 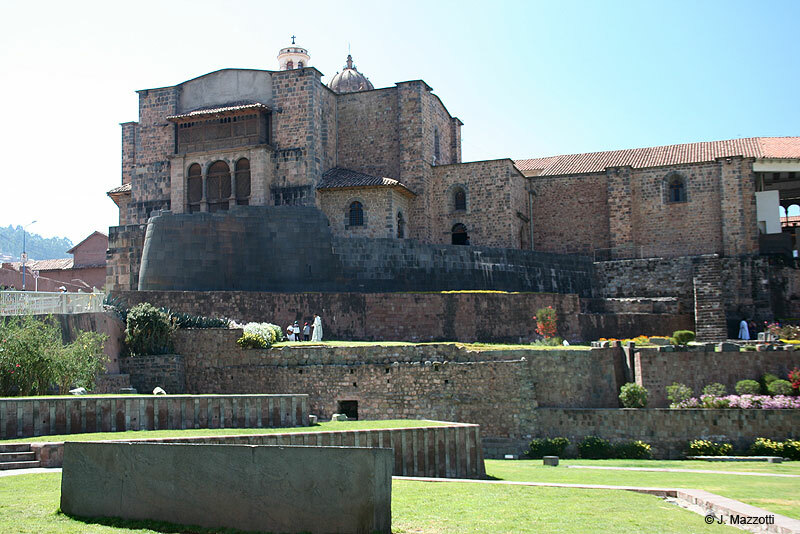 When the Spaniards entered Cusco in 1533, Francisco Pizarro’s brother, Gonzalo, claimed the Inka palace that used to stand on this site for his own, and later gave it to the Marquis Juan de Salas y Valdes, as a reward for his military quests and his loyalty to the Spanish crown. Nevertheless, the historians tell us that this residence was important even during the Inka Empire, since it was the antechamber to the Temple of the Sun (Korikancha), which one could only enter shoeless out of respect for the god. The mansion features an original Inka wall, plus stone arcades, which powerful families in Cusco at that time used to represent their dynastic pride. It is also decorated with four sculptured stone busts above the main door, the reason why it is now called “The Cuatro Bustos Mansion”; the figures are of the Marquis, his first born son, and their respective wives. The hotel Palacio del Inka Luxury Collection is located here. Built in the last years, likeness of those that existed in the Inca City of Cusco. They are sources or spouts of water, where the water was venerated. The most important are Pumaqchupan (corner of El Sol and Tullumayo Streets), Pumacpampa (Santa Catalina Street) and San Blas's neighborhood. Built in honor of one of the biggest Incas in the Tahuantisuyo, statesman and great conqueror. Ideal for tourists, these passes can be bought at the Cusco offices of the Instituto Nacional de Cultura, in the executive offices of the Tourist Pass Committee, and at the entrance to most points of interest (archaeological sites and historical monuments). The Pass costs US $ 25 (integral) / $ 50 (extended) per person, and is valid for access to all main attractions in Cusco city (churches, convents, museums and archaeological sites).